Looking for a restaurant to dine at on Labour Day required quite a bit of labour. Picky Diner and I would brainstorm a list of restaurants that we could visit, and I would call each one in turn only to find out that all of them were closed. 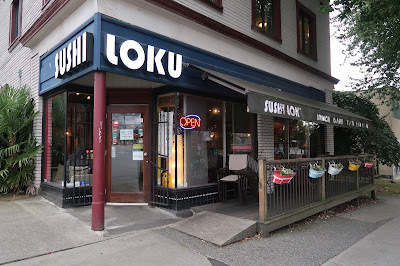 Our laborious search finally came to an end when I discovered that Sushi Loku was open. 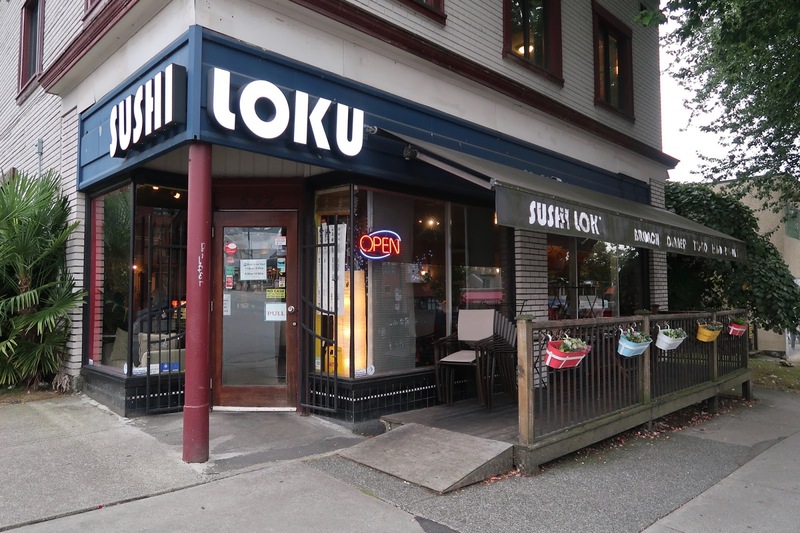 I had visited Sushi Loku once before, but since then, I have seen many reviews and Instagram captions that suggest that Sushi Loku may be better than I made them out to be. The restaurant literally looks like Aburi heaven on Instagram. It was time for me to give them a second chance (not that I had much of a choice either). On my first visit, the interior of the restaurant still retained the scent of the retro diner that used to be there before. Now, that scent was completely gone. They have tidied up the dining space, and the whole place was bustling with diners. Much to my surprise, we even had to wait 15 minutes for a table. From what I could see, there were three waitresses and five chefs on duty, each working hard to keep up with all the orders. It sometimes took some effort to get a hold of the servers. 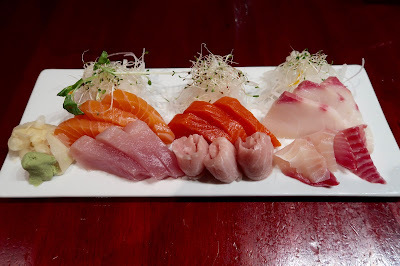 Having heard good things about the sashimi, Picky Diner and I shared an order of Assorted Sashimi (18 pieces). We were quite pleased with most of the fish. Both types of salmon were very fresh and exhibited a delectably smooth texture. 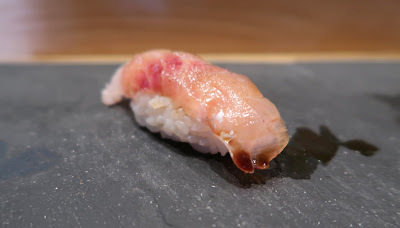 The tuna was very soft, and the toro melted perfectly in my mouth. The only piece that didn't really perform to expectations was the tai. It was remarkably fishy and chewy, and it tasted somewhat like I had grabbed a fishy-smelling fish from the dead fish section of a fish market and just started nibbling on it. After finishing the last piece of the fishy tai, we then noticed something else that was fishy. We saw tables that had ordered after us almost finishing their food and getting ready to leave. Where was the rest of our food? It had been more than 50 minutes since we placed our order. When we inquired one of the servers, we discovered that they had forgotten to place the rest of our order in! Our server, who was new to the job, promptly came over to apologize several times and presented us with two complimentary miso soups. 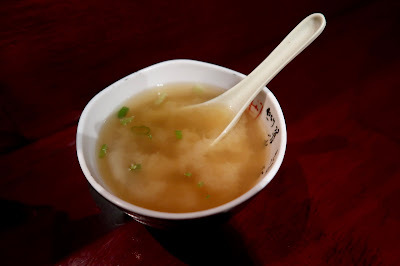 Featuring tofu and green onion, this complimentary Miso Soup was one of the better ones I have had. The balance of ingredients was just right. The Aburi Beef Nigiri was meaty with a wasabi-like zing to it. The garlic chip that accompanied gave the beef more of a punch. The Aburi Hamachi Nigiri (which Picky Diner had and rated) was also decent, though it did fall apart (I don't usually consider this to be a problem). 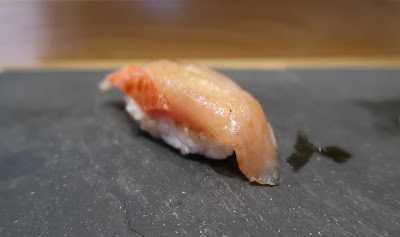 The Aburi Salmon Nigiri was a little weaker in flavour, but the wasabi on top sort of compensated for that. Finally, the Aburi Toro Nigiri came with some deliciously soft toro accompanied by a hit of spicy ponzu that was not overwhelming. Since I lack the skills to pick items from a menu in a reasonable amount of time, I had Picky Diner choose our special roll. 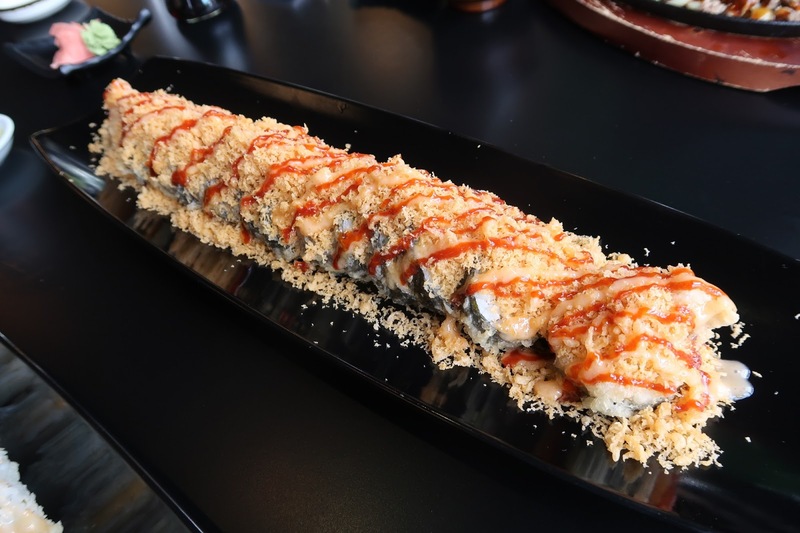 We agreed to get something Aburi-related (seared), so we had the Magma Roll, which came with crab meat, avocado, chopped scallop, masago, spicy mayonnaise, and teriyaki sauce. It was just like a California roll with chopped scallop randomly placed on top. I say "randomly" because the ingredients did not really work together that well. The spicy sauce provided more flavour than the searing, but I did like the soft scallop and how the pieces were bite-sized. Unfortunately, our dinner took a downturn with the Ebi Mayo. 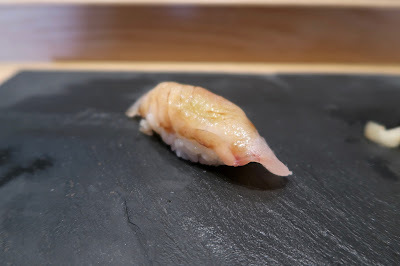 It reminded me of a certain unpleasant experience I had at Okoman Sushi. Yes, it tasted like they mixed up their box of tempura batter with their bottle of glue. The "batter" here was gummy, not crispy at all, and rather gross. The prawns themselves were slightly overdone. Flavour-wise, Picky Diner remarked that the Ebi Mayo tasted like lemon chicken. 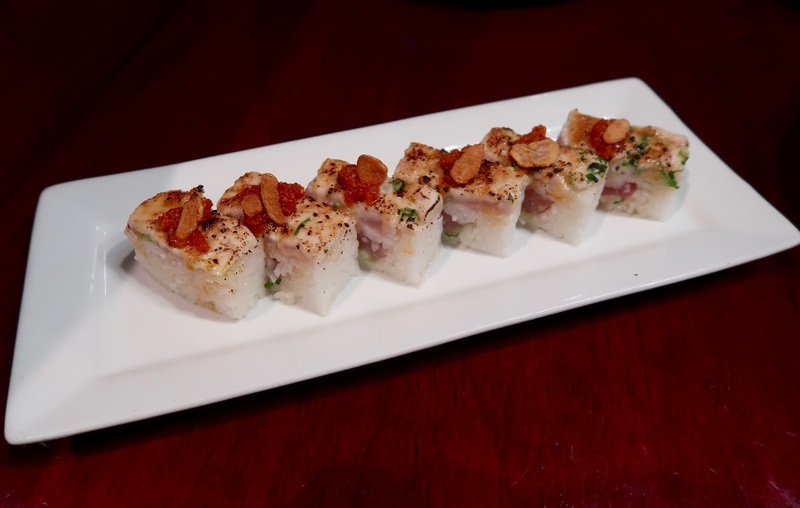 Normally, the goal with Aburi sushi is to create a rich, creamy, and buttery flavour accented by a smokiness that lights up your taste buds. 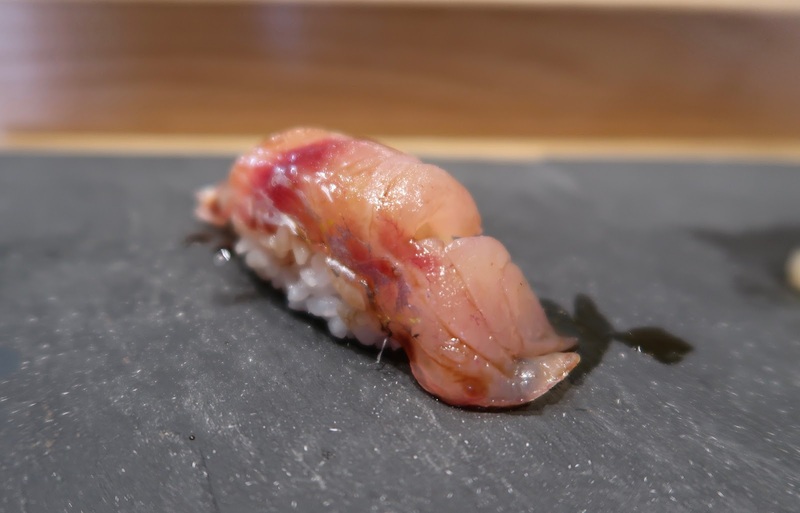 When we looked at the Aburi section of the menu, we were scratching our heads over why almost all the choices contained either balsamic or ponzu sauce. 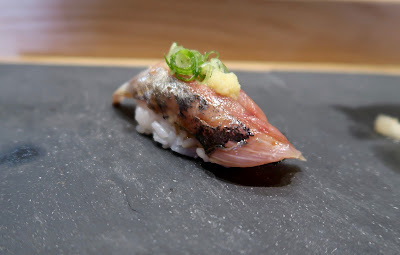 We decided to try out the Oshisushi Negi Toro, which came with seared tuna, green onion, and ponzu sauce. Much to my surprise, the tangy ponzu sauce actually worked. The only issue was that there wasn't enough tuna, so the oshisushi tasted a little rice-heavy. The servers appeared to be overwhelmed, but they were still able to give us friendly service. However, we did have to stay in the restaurant for a full two hours to finish our meal. At least we had our cameras to entertain, and in my case, my notebook as well. My verdict? Both the atmosphere and the food have improved since my last visit, but the food still wasn't always as stellar as it looked. They're getting there though. Recently, Tamsen invited me to do a real-life escape game with him. I was once an avid fan of online escape games, but having not played an escape game in more than a year, my skills had gotten rusty. Of course, that wasn't going to faze me. I promptly started playing six hours of escape games every day for a week to re-train myself and even lost sleep doing so. It felt just like I was cramming for a final exam. On the day of the escapade, I ended up with only three hours of sleep and could barely text in proper words, let alone sentences. Everything felt just right. Except that just before we did our escape game, I needed to indulge in my secret formula for getting ready for anything—sushi. I first spotted Sushi Wow when Tamsen and I last had sushi in Marpole, which was at the now-closed Risty's. 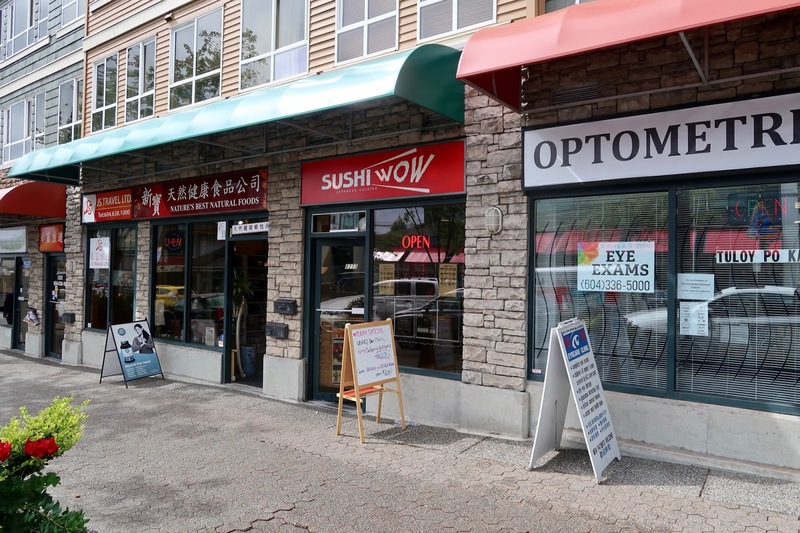 Sushi Wow is a small but seemingly popular Korean-operated restaurant serving a wide assortment of special rolls. 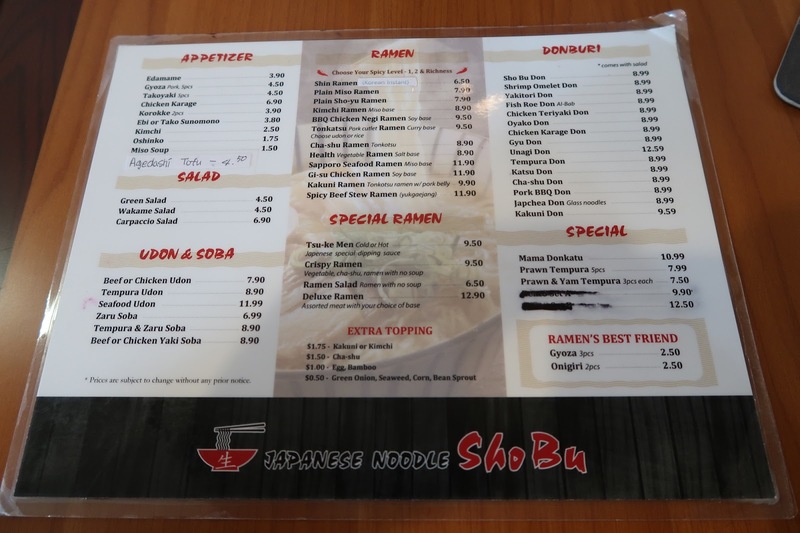 They also have several affordable bento boxes for lunch, but those weren't exactly easy to share (I have a bad habit of wanting to try everyone's food), so we refrained from ordering those. Our lunch started with an order of Salmon and Tuna Sashimi. Given that the restaurant is not authentic and seemingly budget-friendly, the pieces were smaller than expected. 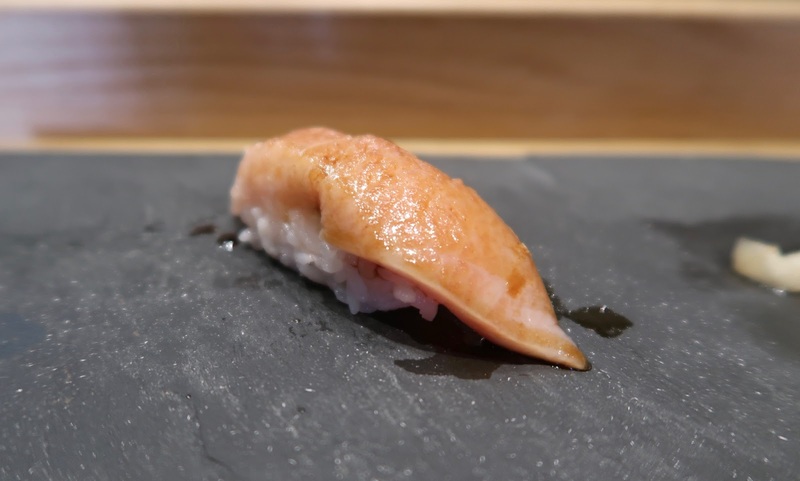 The salmon had a nice smooth texture, but not a rich buttery flavour. The tuna tasted fresh, yet it could be softer. 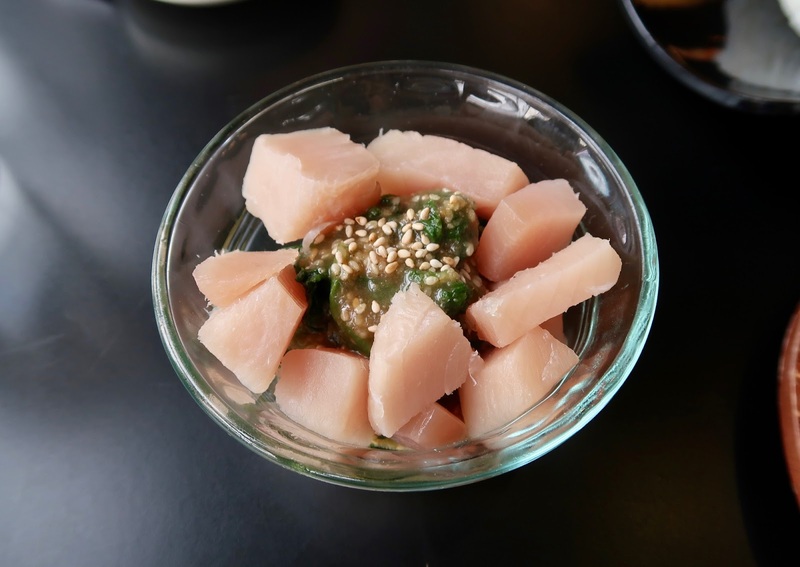 Tamsen, having been to Sushi Wow multiple times, noted that the sashimi is often served too cold and occasionally has frost in it. This time, our sashimi was indeed cold, but not to a point where it was problematic. 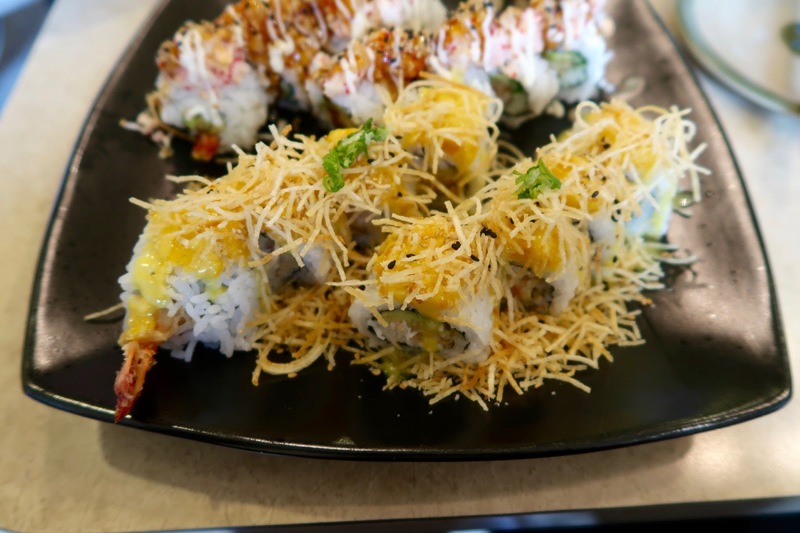 The Mango Tango roll consisted of prawn tempura, crab meat, avocado, mango, crunchy potato sticks, and honey mustard. 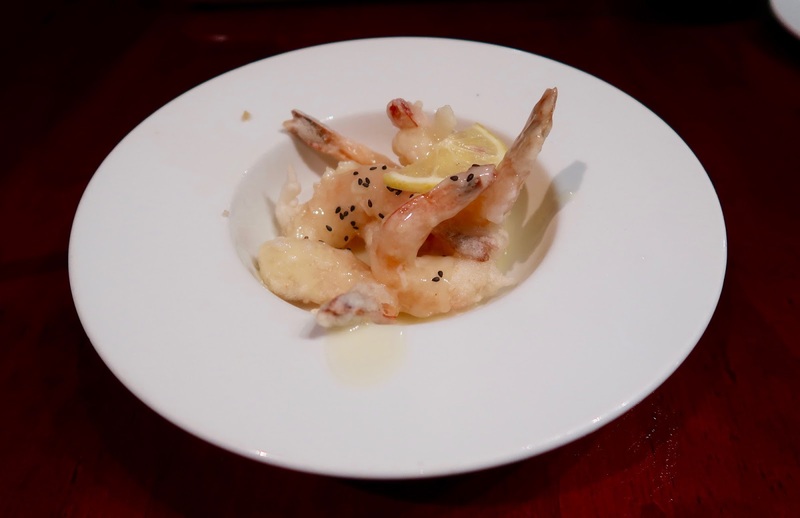 The prawn tempura was savoury and worked well with the mango like a couple gracefully dancing a tango. 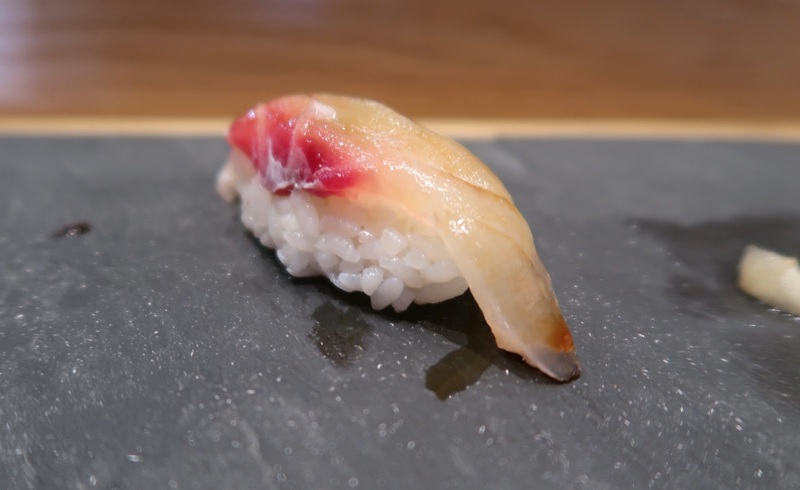 The sweet crab meat inside largely offset the weakly flavoured sushi rice. 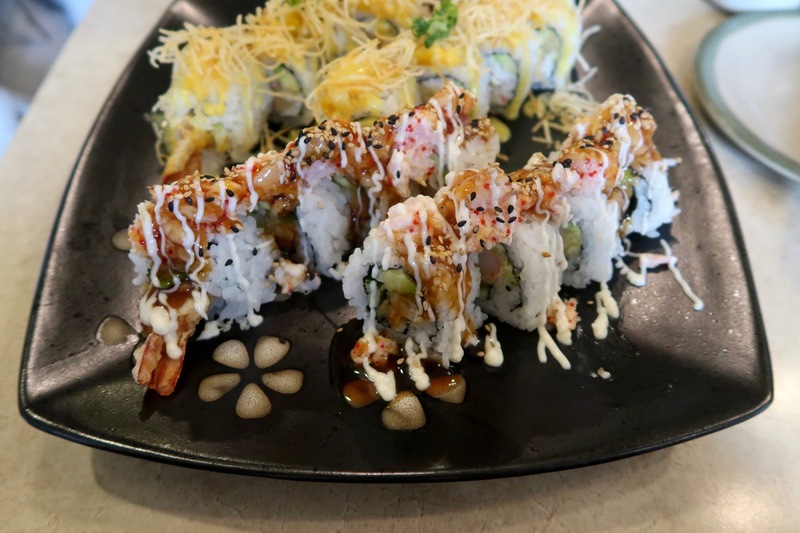 Named after the street the restaurant is located on, the Granville Roll came with prawn tempura, avocado, cucumber, chopped shrimp, tobiko, teriyaki sauce, and mayonnaise. I liked the creamy mix of mayonnaise and teriyaki sauce, while the cucumber and prawn tempura were both quite crunchy. The bland sushi rice was slightly more evident in this roll. Looking for a cooked item to try out, I saw the $4.95 Okonomiyaki on the menu and suggested that we ordered it. What could go wrong with the cheapest okonomiyaki I have ever seen? I suppose that at $4.95, they stack the pieces for you so that you think there's more than there really is. 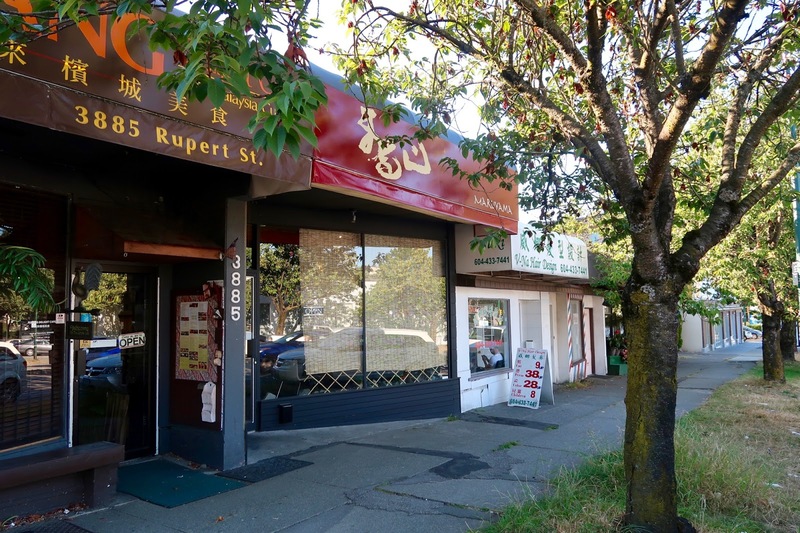 Also, I suppose that they won't make it taste like a proper okonomiyaki, or they risk putting others out of business. 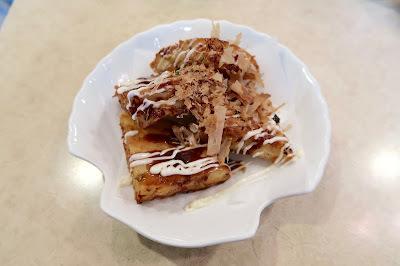 Thick and crispy on the outside, this particular Okonomiyaki tasted like a cross between Chinese radish cake and spring rolls. It actually tasted okay to me, but just completely not what you would expect. The service was attentive, but not very friendly. A smile would have helped. However, the food was decent given the price, and I also liked how there was such a large selection of items to choose from. After we were done, we bulked ourselves up with some bubble tea and headed over to our escape game at E-Exit. As expected, Tamsen did most of the problem-solving (and got us out), while I just ran around in circles working up a sweat. I am obviously an excellent teammate to have. 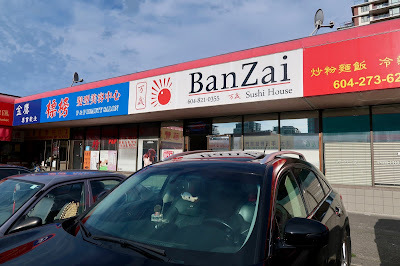 Continuing with our theme of "the bigger the better," Sean, Patrick, Joanna and I headed over to the Vietnamese-operated Banzai Sushi House for dinner after going to Sushi Ville for lunch and visiting two ice cream places in between. If it weren't for Joanna suggesting that we exercise, we would have basically been eating non-stop. What did we do for exercise? We walked along the Stanley Park Seawall. Now, if you thought that we made it all the way around, you had overly high expectations for us. We walked like 15% of it before we decided that ice cream was more interesting and thus headed back to our car. By the time we got to Banzai, I believe I was the only one who was actually in the mood for more sushi. Everyone else was either too exhausted and falling asleep or not even close to being hungry yet. However, by virtue of the divide-and-conquer method, we each sort of managed to sample a decent variety of dishes. I learned from Sean that Banzai is the sister restaurant of Samurai and is known for its large portion sizes, but nothing could have prepared me for this. With tuna, salmon, tamago, crab meat, tobiko, and avocado all packed in there, the House Roll was a whopping 4 inches in diameter. 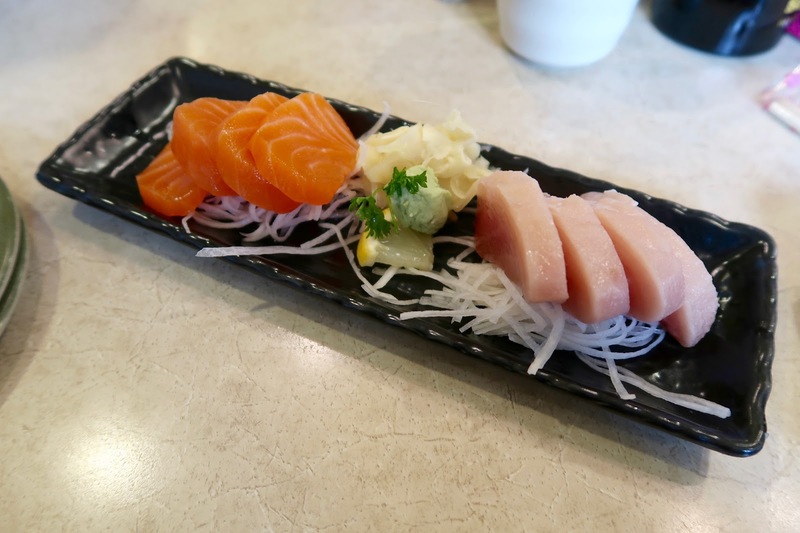 Each piece of salmon and tuna inside could have been one legitimate piece of sashimi. 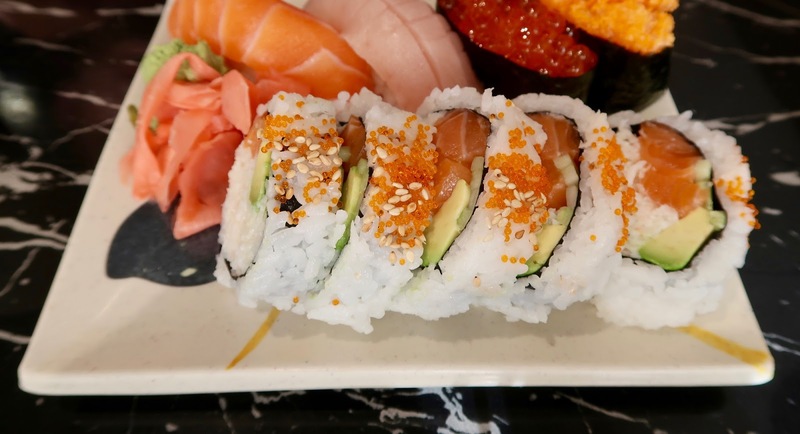 I almost never have trouble picking up my sushi, but with this one, the struggle was real. I enjoyed the soft tuna, the creamy avocado and the sweet crab meat, but the sushi rice was quite bland and the salmon was a bit chewy. 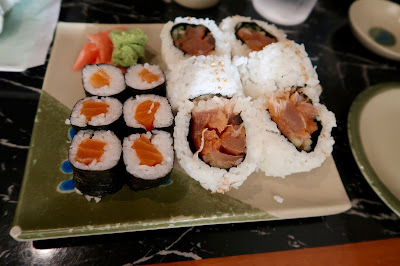 The Alaska Roll, which was slightly less intimidating in size, came with the same sweet crab meat and the same tough salmon. Without the sweetness from the tamago and the softness of the tuna, the tough salmon was more obvious here than in the House Roll. 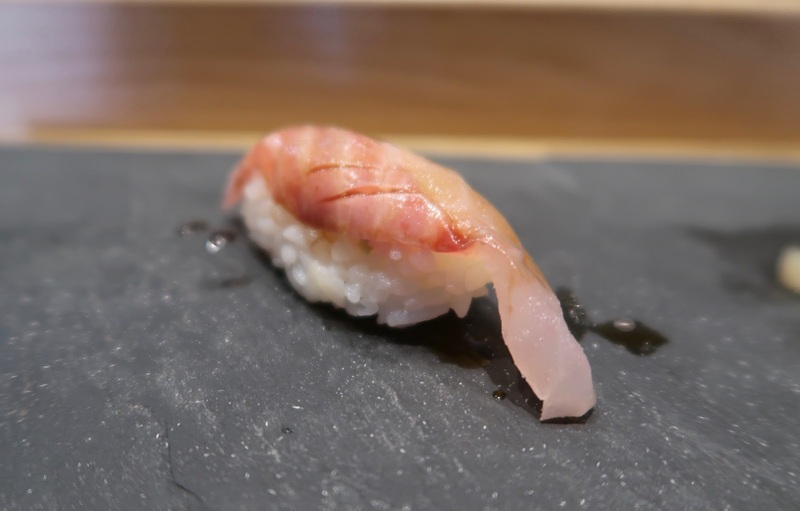 Usually, the quality of the sushi rice is less noticeable in a roll if there is less of it, but here, the rice was packed on like the whipping cream on a Starbucks Frappuccino. 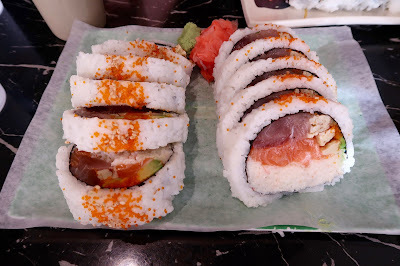 It was a little hard to taste the flavour of the salmon in the Salmon Roll, and the Spicy Tuna Roll ended up being almost non-spicy. For our cooked item, we had the Prawn Tempura, which came with seven juicy prawns that had ample moisture and flavour. Unfortunately, the batter was hard and does not really have a nice crunch. 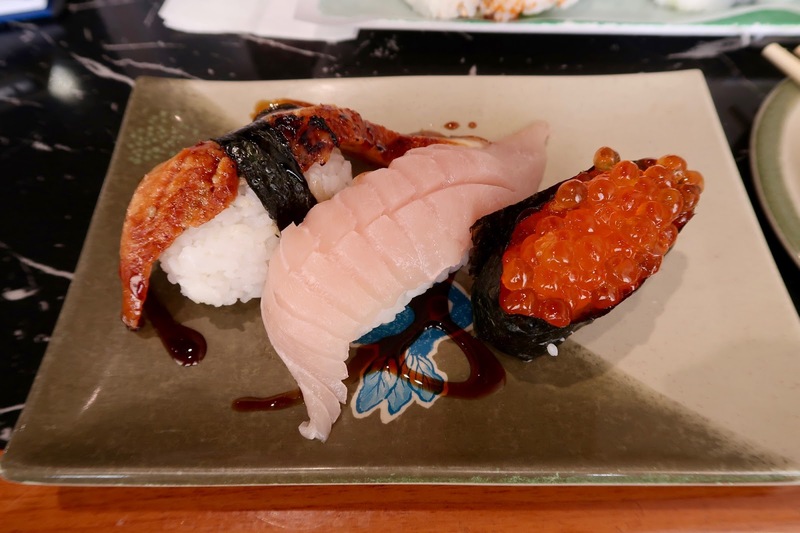 The last obstacle I had to surpass was the attack of the jumbo nigiri (which I rearranged in the photo to only show the pieces that I had). If you asked me one thing I would recommend from this restaurant, it would be the toro. The toro was fresh, juicy, and melty. 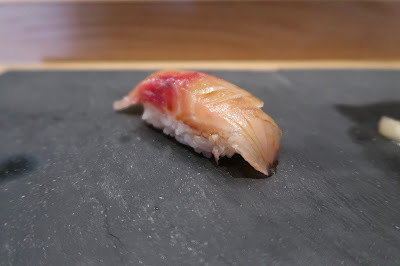 It was one of the best pieces of toro I have had in a while. The unagi, albeit a little fatty, had a nice smoky flavour, and the ikura provided a savoury burst of fish oils. The service we received was timely and friendly. Our server regularly came to ensure that things were in order. Banzai Sushi House satisfies a certain purpose, and that is to make you full and make your wallet happy at the same time. I'd be hard-pressed to find any other sushi place where I could get full with less than $15. Although I did not have enough stomach room for a full order of sashimi, it seems apparent that sashimi is one of their strengths. From what we tried, the salmon wasn't excellent, but the tuna and toro were both very fresh and enjoyable. Whenever I have companions joining my sushi adventures, I always try to let them pick the restaurant. As long as it is a reasonable choice that won't likely give me food poisoning, I'm down. However, Joanna, Patrick, and Sean could not decide on one place to go. 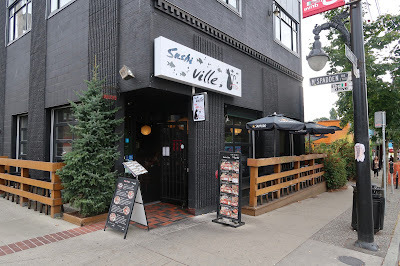 Sean's go-to restaurant was Banzai Sushi House, and Patrick is a loyal fan of Sushi Ville. Joanna just wanted to exercise and get ice cream. We ended up solving things the Raymond way: let's go to all three, one after another! I had been to Sushi Ville once before and was not very impressed. However, Patrick persuaded me to give them a second chance by claiming that he was still alive after having been a regular there. Well, there was some truth to his words. There were also much fewer people this time (since we came on a weekday afternoon), so the food and the service should be better, right? I would never order the giant rolls myself, but for Sean and Patrick, it is all about the bang for the buck, so here we go. The sushi rice was about as crappy as before (it was too tightly packed and quite bland), but everything else seemed in order. With lettuce, cucumber, avocado, crab meat, salmon, tuna, and tamago, the Giant House Roll featured sweet tamago that complemented the crab meat well. 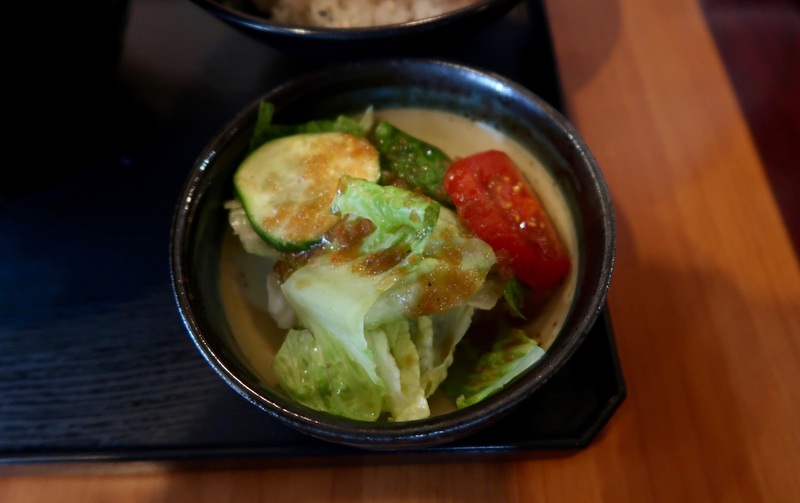 It also came with mild wasabi mayonnaise on the side for those who would like more of a kick. The Giant Palm Beach Roll consisted of cucumber, crab meat, spicy tuna, and yam tempura. This was our favourite roll of the day. I believe it is also the reason Patrick is a regular of this place. The mildly spicy tuna did a good job of covering the blandness of the sushi rice. 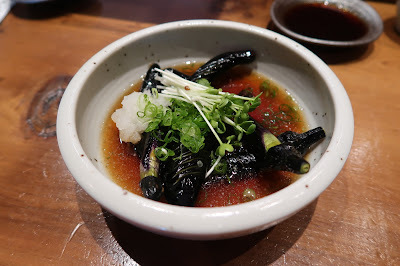 The yam tempura was pleasantly sweet, and together, the ingredients formed a nice mix of flavours. The Giant Spicy Crunchy Roll came with cucumber, avocado, spicy crab meat, and prawn tempura. This must have been the extra-giant version because we counted 14 pieces instead of the normal 10 for giant rolls. My table mates were more than pleased about the increase in quantity. 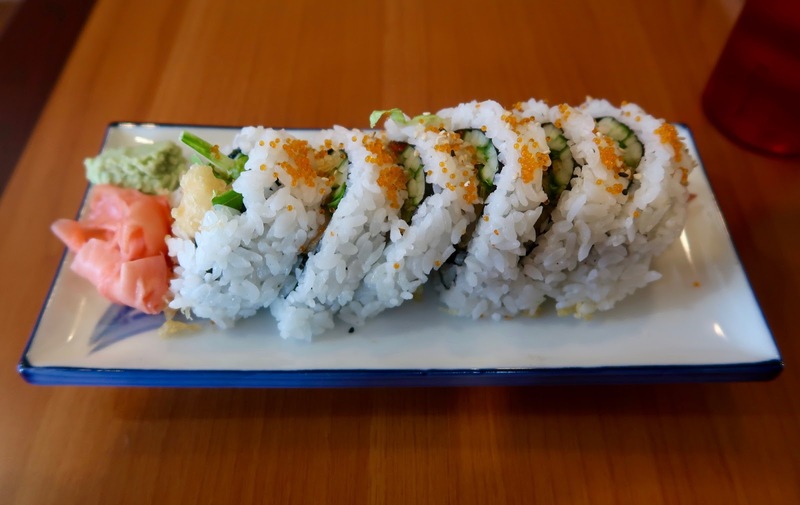 Quality-wise, I felt that it was the weakest of the three rolls as the rice was too tightly packed, and the texture was a little hard around the edges. The batter inside was also quite greasy. 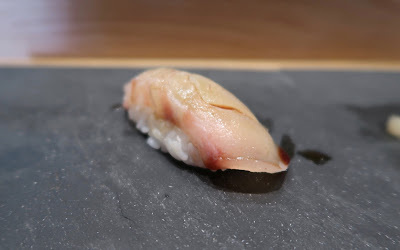 Next, the Tuna Gomae was very moist with a nice sesame flavour. However, none of us were fooled by the tuna, which tasted slightly fishy and was not very soft. The cutting of the pieces was not very clean either. Since I wanted to try a bit of everything, I insisted on getting an entree, so we ended up with the Beef Teriyaki with Rice. On my last visit, I had the Chicken in Soggy Wonderland, and this time, I was graciously presented with the Beef in Soggy Wonderland. What is up with their teriyaki?! 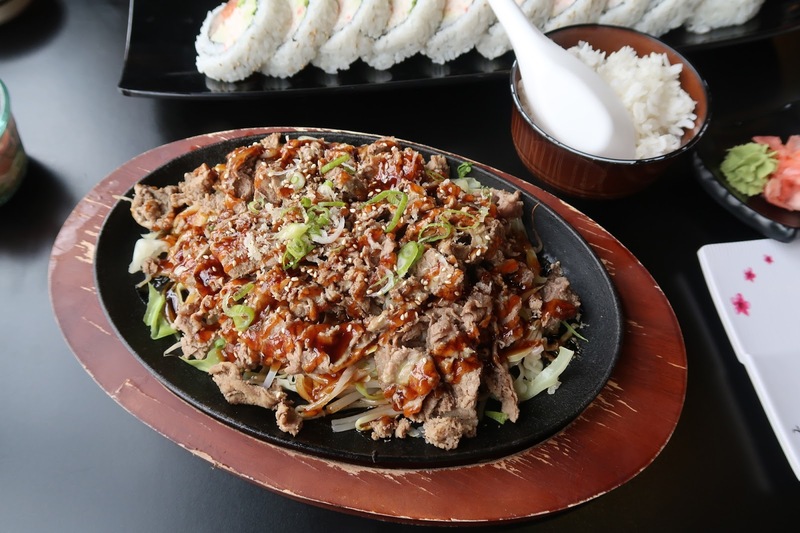 Other than that, the teriyaki sauce provided a good amount of sweetness, and there was an abundance of cabbage and bean sprouts underneath, some of which were nice and soggy as well. One thing I don't like about school is that it makes everyone too busy to join me on my sushi adventures. I seem to be the only one with my priorities straight—sushi first, education second. As soon as my two-week summer break started, I seized the opportunity and messaged several of my friends to have sushi with me. Somehow, after the scheduling process was complete, I ended up having to have sushi for every single meal two days in a row. Oh, the horror! Joining me for the first leg of my sushi endurance test were my sister and my two homies, Angus and Tamsen. 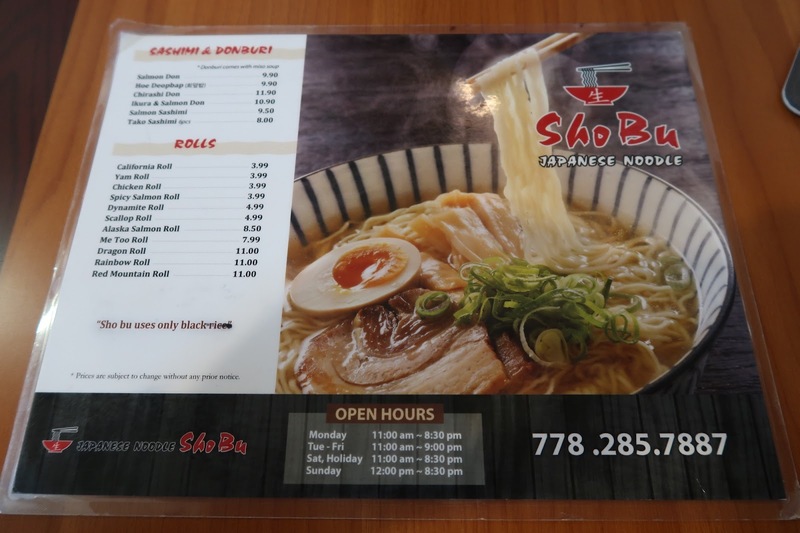 Sho Bu Ramen is a small Korean-operated restaurant with about 20 seats and is located in a desolate and slightly decrepit-looking mall known as Henderson Place. 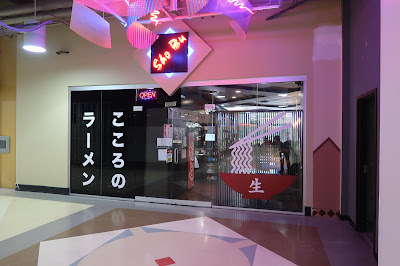 On the left side of the entrance, こころのラーメン is Japanese for "ramen from the heart." On the right side of the entrance was a bowl of noodles labelled with the kanji for "life." It sure seemed like eating the ramen would provide us with everlasting health and longevity, so into the restaurant we went. Since I had pretty much just woken up, I decided to start my day off nice and easy with a simple Dynamite Roll. 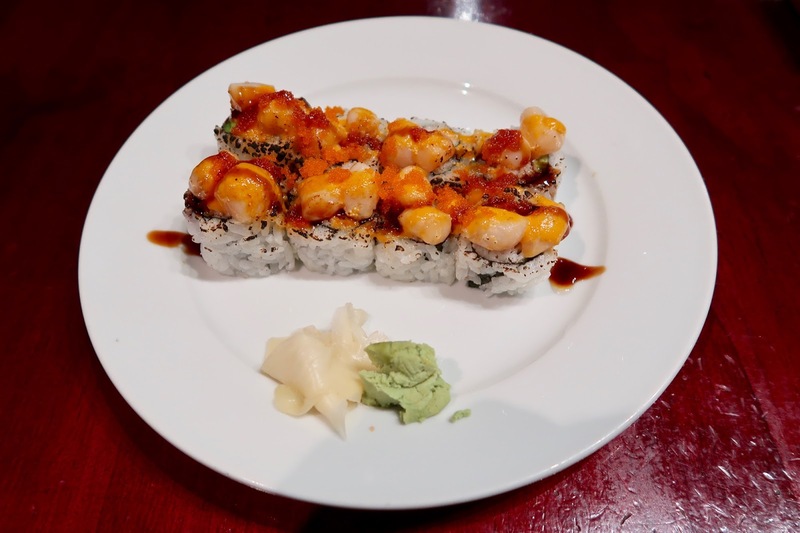 Made with just one prawn, the balance of ingredients was off as the taste of lettuce began to dominate the roll. 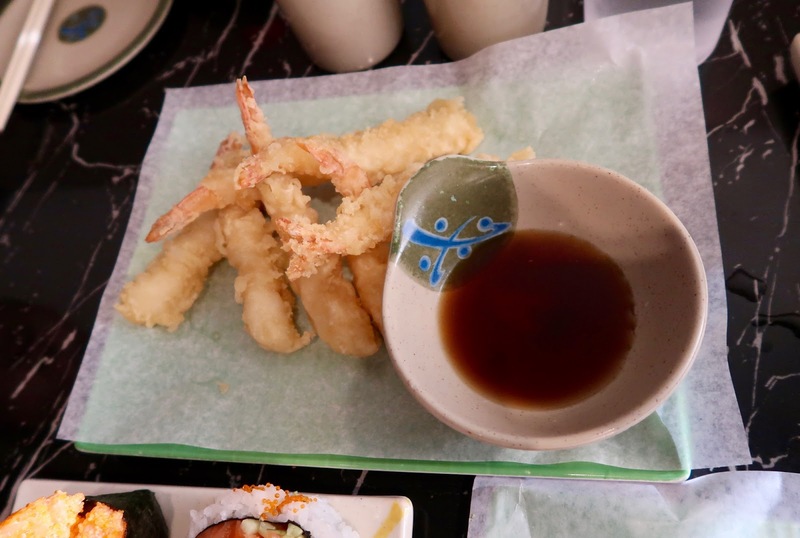 The prawn tempura also ended up being quite greasy. Very helpful was the fact that none of the ingredients for the special rolls were listed on the menu, so I just went for the last and most expensive roll because that is totally a smart way to order. 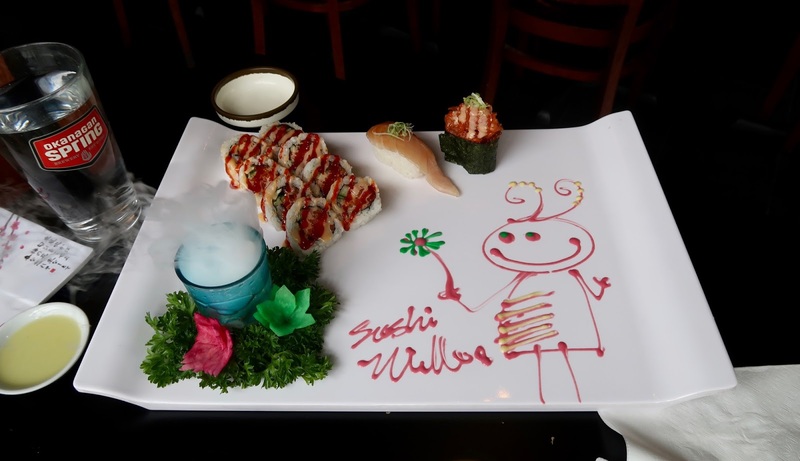 I was handsomely rewarded with one of my biggest nightmares: cream cheese in my sushi. 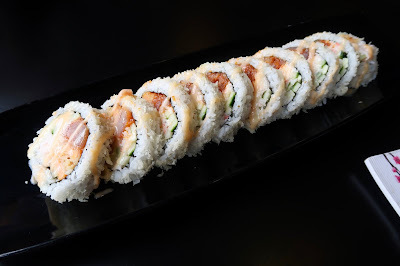 Nonetheless, the Red Mountain Roll, a California Roll with cream cheese inside and spicy salmon top, was a nice blend of flavours. The spicy salmon had a bold kick, and the buttery flavour of the salmon complemented the creaminess of the cream cheese, which was conservatively used. 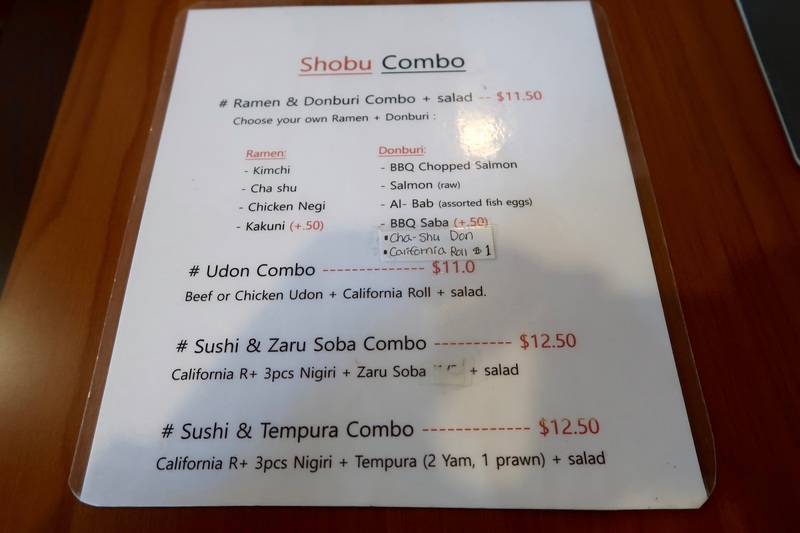 The $11.50 Shobu Combo is perhaps the best deal at Sho Bu Ramen and comes with one full-sized ramen, a mini donburi, and a small salad. The combo was sufficiently large that both Angus and my sister were full after sharing one together. 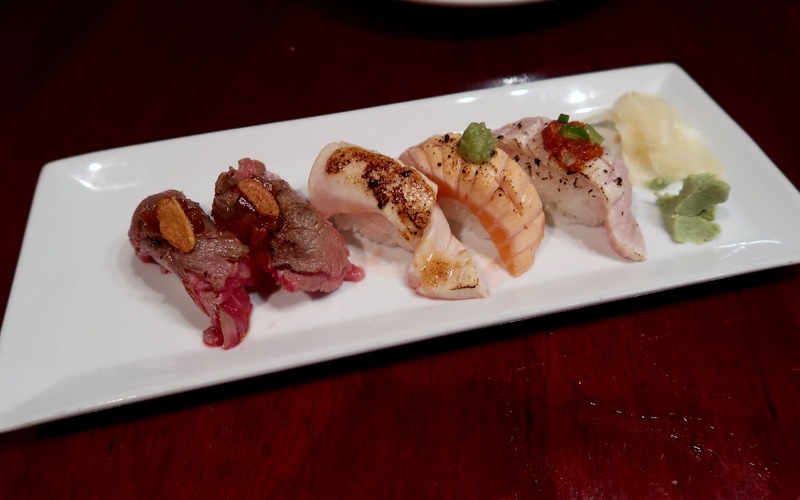 However, since Tamsen ordered an entire combo for himself (and helped me finish some of my sushi), I wasn't going to let myself be out-eaten by someone who was slimmer than me. With my pride at stake, I followed suit and ordered an entire combo for myself too. 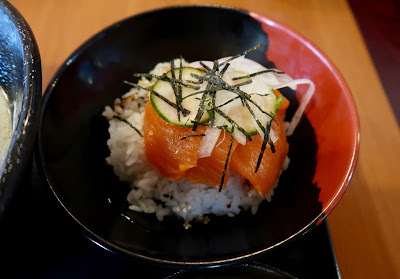 The mini Salmon Sashimi Donburi included in the combo was not exactly a highlight. Although the seaweed provided some much-needed flavour to the donburi, the rice was dry and the salmon did not taste very fresh. On the other side of the spectrum, the Salad was quite acidic and vinegary and almost came with too much flavour. That being said, there was ample moisture within the salad, and if you like a little zing, you may find this enjoyable. 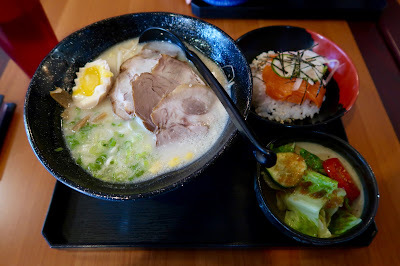 Fortunately, the Cha Shu Ramen was a delight, featuring well-balanced broth that absorbed the flavour of the tender chashu. 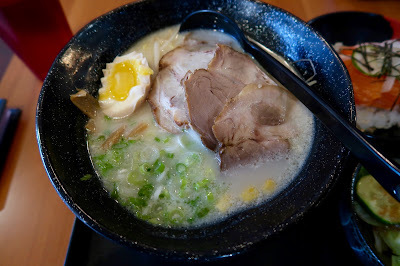 The ramen noodles also exhibited a characteristic egg-like flavour and were very filling. I had a significant amount of trouble finishing this bowl of ramen, but I fought with every ounce of my strength and managed to conquer it. I felt like I had just made it to the top of Mt. Everest. Meanwhile, my mates had to watch me slowly slurp noodles for a good 20 minutes after they were all done. During our visit, we received friendly service, although the service was rather sparse as the staff frequently stayed behind the counter. 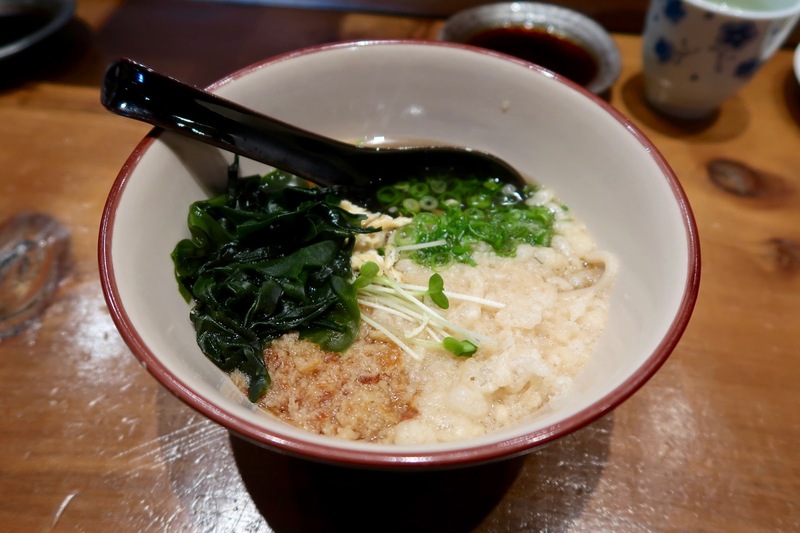 With its decent ramen offerings, this place has started to become popular among those who live or work nearby. After spending just $15/person on lunch, I was already so full I could barely walk. However, much to my chagrin, Tamsen strolled right into the food court just a few moments later and casually proceeded to get a bubble tea and an egg waffle for dessert. Sigh... I had no choice but to ultimately admit defeat.